Gionee has launched its Gionee M7 Power at the Thailand Mobile Expo 2017 today. 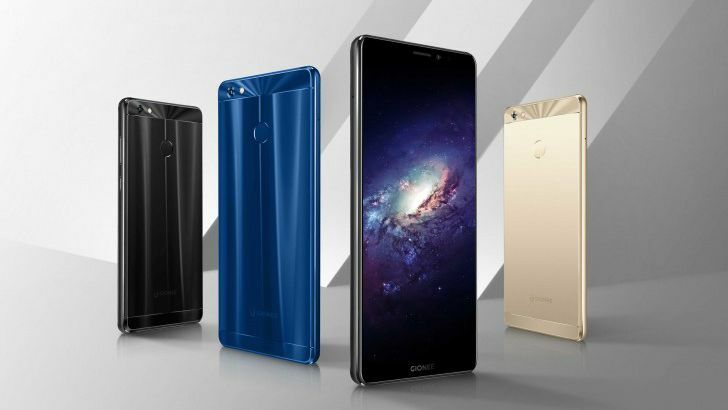 The phone featuring a 6-inch FullView display has a massive 5,000 mAh battery but is otherwise less powerful than the Gionee M7 which was launched in China earlier this week. Gionee had already introduced the M7 Power as ‘Big Gold Steel 2’ along with M7 smartphone in China. Now the device has been released for the global market. The Gionee M7 Power is currently available in Thailand priced at THB 9,990 (Rs. 19,600 approx.) and will soon roll out in other Asian countries as well. First, if we talk about the build, Gionee M7 Power comes in high-grade 6-series aluminum back shell. The Gold color of the phone comes with a laser-engraved finish, while Black and Dark Blue colors in the laser-drilled finish. It features a fingerprint sensor on the back. Looking at its dimensions, it measures 156.3 × 75.6 × 8.6mm and weighs 187 grams. The display is also one of the highlights of the phone. It features a 6 inch HD+ (1440 x 720 pixels) FullView 2.5D curved glass display with 18:9 aspect ratio. There are no buttons on the front, only a tiny bezel on top and bottom. Software wise it runs on Android 7.1.1 Nougat with Amigo OS 5.0 on top. Coming to the hardware, it packs an octa core Qualcomm Snapdragon 435 Mobile Platform with Adreno 505 GPU. For memory and storage, it has 4GB RAM with 64GB internal storage. The storage can be expanded up to 256GB with microSD card. The phone supports Hybrid Dual SIM (Nano +Nano/microSD card). In the camera department, it features a 13MP primary camera with an LED flash, f/2.0 aperture and PDAF. For selfies, it sports an 8MP front-facing camera. On the connectivity front, the device comes with 4G VoLTE, Wi-Fi 802.11 b/g/n, Bluetooth 4.2, GPS, 3.5mm audio jack and FM Radio. Powering the phone is a 5,000mAh built-in battery with fast charging support. Notably, it promises up to 2 days of battery life with intelligent power management. The Gionee M7 Power is priced at 9,990 Thai Baht (Rs. 19,600 approx.). The phone comes Gold, Black, and Dark Blue colors. It will go on sale starting from Thailand and will soon roll out in India, Myanmar, Nepal, and Philippines etc. It already has launched in China. Gionee also says that it also plans to enter Indonesia, Malaysia, and Vietnam.